Please note: I read this book probably in 2003 or so, and wrote the review a long time ago, so please don't judge by my current standards, but I'm wanting to get this book "out there", so am reposting this review.How I Came to Read This Book: My husband had this book and recommended that I read it. It is a large tome and I approached it with a bit of trepidation, expecting something Dickenson, but I was very pleasantly surprised. It is very approachable and highly readable. My Synopsis: This book is, basically, about the life of Tyl Ulenspiegl, from his birth, following him as he grows into manhood. He is a highly charismatic person and, although it is a bit of a detriment in the times he lives in (set in the earliest years of Christianity, when it was most set on wiping out any vestiges of Paganism using the most ghastly means possible, and upholding "holiness" using those same means), quite the ladies' man. The story follows him as he is banished from his home village in Belgium (I think - it has been a couple years since I read it and it is a bit hard to excavate from where it is right now) for many years (as well as keeping us updated on what is transpiring back home) and he keeps running across many of the same characters in his travels. He unfortunately arrives home just in time for a gross miscarriage in justice; but I do not wish to ruin the story by providing any spoilers, so I will not go into any specific details. My Thoughts and Review: This book provides many moments of laugh-out-loud hilarity; it also has just as many moments of somber sorrow. It provides ghastly horror as well. The overall message of the story seemed to be that when the Men in Black Robes (religion) were given too much power over the people, then destruction of their lifestyle was sure to follow; however, life would go on, because humanity could rise above any circumstances thrown their way. In the end, it is a message of the triumph of humanity over the pettiness of religious dogma, I felt. I should also point out that not all religious persons were painted in negative light - only those who were extremeists. Many were true Christians, willing to follow the examples set by Christ of true love for their neighbors. I don't want to put off people from reading this book, thinking that it slams all religion, because it doesn't - it just speaks very strongly against dogmatics who attack that which they don't understand and thus feel they must destroy it. This is an amazing book and I am very sad that is is no longer in print - I hope that people can get their hands on it and read it - it is very worthwhile. Перечитала. Кажется, стала понимать немного больше, но всё равно к середине запуталась в исторических личностях и географии. Никак не могу воспринять всю Легенду целиком, распадается на мелкие истории о народном герое и его окружении. Все герои очень аппетитно едят, так и хотелось забить на все свои ограничения и жрать жирное, жареное мясо двумя руками, урча и причмокивая. Но выше всего - дух и сердце Фландрии, они прекрасны, они бессмертны. Ovo izdanje sadrži petodelni roman i zbirku priča. Zbirka priča je iz XIV veka, pisana nemačkim jezikom i autentični je prikaz Tilovog "stvarnog" života lakrdijaša. Međutim, on nije bio čist lakrdijaš i dvorska budala, kao što to obično biva. On je metaforički junak nemačkog naroda, koji je tu da ljudima "stavi" naočari na oči i natera ih da se pogledaju u ogledalu (otuda i iskrajanje kovanice njegovog nadimka - sovuljagino ogledalo). Sve to kroz pregršt narodnih umotvorina (slično kao što radi i Grimelhauzenov Simplicisimus ili Servantesov Sančo Pansa) i, reklo bi se, da je taj satirični pristup prijemčiviji deci. Roman u pet nastavaka delo je Belgijanca de Kostera i pisano je u XIX veku, francuskim jezikom. De Koster je kao osnovu uzeo tradicionalnu zbirku priča o Tilu Ojlenšpigelu i na tu potku razradio priču o junaku jednog naroda, koji je i sam potekao iz nižih slojeva društva, ali mu duha i dovitljivosti nimalo ne manjka. Tila sada prati dežmekasti drugar Lame Gudzak. Osim što i roman obiluje narodnim umotvorinama, ne nedostaje mu i čiste, nepatvorene, narodne erotike, koja je, najčešće prišivana lakrdijama koje Til izvodi, a u koje Lame zapada. Pored pošalica, de Koster je obradio dobrano i inkvizitorski proces kažnjavanja i spaljivanja jeretika u srednjem veku, i koncept malleus maleficaruma. Radnju je ustoličio da se dešava paralelno u Flandriji i na dvoru Karla V kome se rodio naslednik Filip, istoga dana kada i Til. Na kraju drugog dela, Tilu se kroz snoviđenje i trans njegove posestrime Nele ukazuje metaforički zadatak, postavljajući pred njega cilj. Od trećeg do petog dela, Til ima ulogu nacionalnog heroja: da pomiri zaraćene strane - Belgiju i Holandiju i, praktično, se bavi tematikom Osamdesetogodišnjeg rata. Something really fabulous and incredible!.. The harsh living standards and brutality with which these people lived during the Spanish Inquisition and struggle for dutch independence is mind blowing. Scenes of torture are described in truly horrific detail. The prints are absolutely breathtaking. But the way Tyl, our hero, deals with this mistreatment and struggles for peace of mind and righteousness through, oddly enough, clowning, is heartening and extremely strengthening to the spirit.I was so upset and enamored and moved by this book I couldn't stand to finish it, so I unconsciously lost it. Having read the book in Russian, I fell in love with Tyl at an early age. His transformation at the hands of inquisition is breathtaking. The powerful refrain repeated throughout the book when Tyl is about to act, and say anything dangerous, "the ashes of my father are beating near my heart" is the driving force for most of the latter part of the book. The tale of Tyl may be very old, but its relevancy is everlasting. I knew the music inspired by this book before I knew about the book, so I thought it was high time I read it. I will just find the correct CD and put it on...This is a novel incorporating some scatological low German folk tales. The name Ulenspiegel most probably originates from the low German 'ul'n Spegel' rather than the high German 'Eule und Spiegel'. Tyl is still a trickster, but de Coster has also made him something of a Flemish Protestant resistance hero. He is alternately cadging food and spying for the resistance.It contrasts the life of Flemish prankster Tyl with Spanish prince Philip (later Philip II). The two strands do not always fit together perfectly and the juxtaposition of merry little pranks with Spanish Inquisition torture is startling. It took me some time to decide the extent that this is de Coster's intention and this affected my rating. I think the shock effect is intentional and the contrast is supposed to be jarring. I would have preferred a merry little picaresque novel, but I shouldn't mark the book down purely on my reading preferences when the author has achieved his intention. In retrospect I decided the contrast is actually quite clever, the Flemish people would really much rather get on with eating, drinking, trading, making money and having a pleasant time without getting involved in religious or political controversy and the folk tale element reflects that, a rebellion in support of a quiet life. Вперше прочитав Улешпігеля у сьомому класі - і читав саме українською. Загалом, те, як і яка ця книга потрапила мені до рук є дещо неймовірним збігом або, ймовірніше, дивом. Хтось з однокласниць (пам'ятаю хто) подарував мені Тіля на 23 лютого - це перша складова дива, тому що зазвичай обходилися чимось саморобним. Дівчата щось вишивали або малювали на 23.02, а хлопці - випилювали або випалювали на 08.03. А тут - товстелезна книжка, золоті літери на брунатній обкладинці. Друга складова дива (або збіг, це кому як до вподоби, я не наполягаю) - мова. Я виріс на Півдні, в майже тотально російськомовному місті, навчався в садочку та школі з російською мовою виховання-викладання, українську чув у селах, де мешкали діди-прадіди. Звісно, що українська мова здебільшого траплялася мені двічі на тиждень на уроках у школі. Аж раптом - Тіль.Завдяки карколомним пригодам і вбивчим печалям Уленшпігеля я вперше глибоко занурився в українську мову, відчув її багатство, наявність в ній різних стилістичних шарів, її пристосованість не тільки до сільського життя, але й для потреб найвищого мистецтва - Літератури.Костер справді написав один з тих епосів, які вибудовують націю. Ба навіть більше: як на мене, Легенда - як і "Дон Кіхот", "Гаргантюа і Пантагрюель", "Іліада" та "Одісея" - працює ширше та глибше, і вибудовує - спочатку читача, далі націю, потім - людство, а загалом - той Храм культури, про який йдеться на останніх сторінках роману бр.Стругацьких "Град обреченный".В Легенді багато чого може вразити - від історичних фактів знущання одного народу над іншим, монарха над "суб'єктами" та глибокого втаємничення автора в історичний контекст до блискучих формул. О, хто не здригнеться, коли вперше прочитає "Попіл Клааса стукає в мої груди"? - це саме той, найвищий ґатунок формули, яким, наприклад, користувалася Роулінг, коли писала найпотужніший рядок семикнижжя: "кістка батька, кров ворога та плоть слуги".Поради для насолоди Легендою: читайте українською, а примітки дивіться за виданням у "Библиотеке всемирной литературы". І друга - якщо книжка вам трапиться у підлітковому віці, перечитайте її років за 20.МАСТ-РІД! I first read this in 1995 or 96 when I was a kid, I remember going through the whole book in a day or two, my eyes were red when i finished the last page.. It was surreal, as if all the characters from the novel became alive and everything started happening right before my eyes.Simply amazing. Clever and funny, sad and scary, and above all unbelievably free spirited. How much soul was put into writing this book is beyond words..
ashes of Klaas is knocks on my heart! В семье угольщика Клааса родился долгожданный сын, которого назвали Тилем. Рос он весёлым и гораздым на выдумку мальчишкой, любил шутки и розыгрыши, а обострённое чувство справедливости заставляло его порой творить то, что обычный человек делать поостерёгся бы. Но благодаря лёгкому нраву и обаянию Тиля, всё ему прощалось. Так и жил бы дом его трудом и миром, если бы одновременно с ним не родился другой мальчик, жестокий и холодный садист. Беда в том, что второго мальчика звали Филипп и был он сыном короля. * * *Интерес к книге возник с самого детства, когда я случайно наткнулась на набор открыток с кадрами из советского фильма и краткими диалогами на оборотной стороне. Личность Тиля меня заинтриговала – ну а как же, романтик ведь, но, к счастью, книжку в доме я не нашла. К счастью, потому что вряд ли десятилетний ребёнок понял бы подтекст, а описания пыток, учиняемых славной инквизицией, наверняка заставили бы меня видеть по ночам кошмары. А вот для двадцативосьмилетней меня, закалённой ПЛИО, книга была уже вполне по зубам.Роман читался сложно и показался мне очень неровным. Приключения Тиля в первой части показались просто пересказом многочисленных европейских сказок про неизменно ловкого и хитрого героя, который всегда дурит злобного антагониста и непременно выходит сухим из воды. Но пересказ всегда суше оригинала, поэтому интересно это было скорее с точки зрения литературного анализа. Описания войны и сражений в условной второй части (а на деле – в книгах со второй по четвёртую) тоже были не слишком любопытны – много персонажей, возникающих из ниоткуда и исчезающих в никуда, слабо прописанная хронология и периодические сапоповторы. Но вот всё, что касается семьи Тиля написано выше всяких похвал. Хитросплетения сюжета, смесь реальности и сверхъестественного, которое, впрочем, потом окажется ничем иным, кроме как очередным проявлением мерзкой человеческой натуры, стойкость Клааса и Сооткин, преданность Неле, сумасшествие Катлины, не ведающей, что она натворила, - всё это не даёт остаться равнодушным и затягивает в роман. Несмотря на то, что аллюзии к Библии чётко видны, герои являются не схематичными узнаваемыми персонажами, а превращаются в живых, настоящих людей из плоти и крови, их поступки понятны и просты и не могут не вызывать уважения и сопереживания. Фигура Тиля при этом периодически остаётся где-то на периферии, и только в самом конце все разрозненные на первый взгляд эпизоды свяжутся в одно и объяснение, кто же на самом деле те Семеро, которых должен был победить Уленшпигель, заставит задуматься о смысле отдельных кусочков паззла и всё встанет на свои места. В результате получается то ли сказка с элементами приключенческого романа, то ли исторический детектив с элементами притчи, но прочитать определённо стоило. My husband had this book and recommended that I read it. It is a large tome and I approached it with a bit of trepidation, expecting something Dickenson, but I was very pleasantly surprised. It is very approachable and highly readable. This book is, basically, about the life of Tyl Ulenspiegl, from his birth, following him as he grows into manhood. He is a highly charismatic person and, although it is a bit of a detriment in the times he lives in (set in the earliest years of Christianity, when it was most set on wiping out any vestiges of Paganism using the most ghastly means possible, and upholding "holiness" using those same means), quite the ladies' man. The story follows him as he is banished from his home village in Belgium (I think - it has been a couple years since I read it and it is a bit hard to excavate from where it is right now) for many years (as well as keeping us updated on what is transpiring back home) and he keeps running across many of the same characters in his travels. He unfortunately arrives home just in time for a gross miscarriage in justice; but I do not wish to ruin the story by providing any spoilers, so I will not go into any specific details. This book provides many moments of laugh-out-loud hilarity; it also has just as many moments of somber sorrow. It provides ghastly horror as well. The overall message of the story seemed to be that when the Men in Black Robes (religion) were given too much power over the people, then destruction of their lifestyle was sure to follow; however, life would go on, because humanity could rise above any circumstances thrown their way. In the end, it is a message of the triumph of humanity over the pettiness of religious dogma, I felt. I should also point out that not all religious persons were painted in negative light - only those who were extremeists. Many were true Christians, willing to follow the examples set by Christ of true love for their neighbors. I don't want to put off people from reading this book, thinking that it slams all religion, because it doesn't - it just speaks very strongly against dogmatics who attack that which they don't understand and thus feel they must destroy it. This is an amazing book and I am very sad that is is no longer in print - I hope that people can get their hands on it and read it - it is very worthwhile. “La légende et les aventures héroïques, joyeuses et glorieuses, D'Ulenspiegel et de Lamme Goedzak au pays de Flandres et ailleurs” provides a picaresque tour of the Spanish Netherlands during the Dutch War of Independence (1566–1609). The novel is at once a compendium of medieval tales, an attack on autocratic monarchies and an anti-clerical manifesto. As a practicing Catholic I detested the work, but I must admit that in certain respects it is rather well done.As the author attempts to write in the style of Rabelais, the novel contains many short comic sketches in which the characters eat and drink lustily. The objective of the author is to show that the common people, personified by the protagonist Till Eulenspiegel and his sidekick Lamme Goedzak, are joyous in nature. Their great enemy is the Roman Catholic Church which is against joie-de-vivre and which supports the tyrannical Spanish Habsburg Regime of Philip II which is oppressing the poor Flemish. The heroes are the Calvinist Dutch nobles (Les Gueux) led by William of Orange who are fighting for the independence of the Low Countries. As the novel progresses the buffoonery declines as Till Eulenspiegel and Lamme Goedzak become active combatants fighting with les Gueux against the Spanish. Eulenspiegel, the tavern trickster, even rises to become a ship’s captain in the Dutch navy.The most remarkable aspect of “La légende … D'Ulenspiegel” is its portrayal of the savage nature of justice under the Habsburg regime in the Netherlands. The Inquisition is implemented in the Spanish Netherlands. Witches and heretics are burned and tortured. The courts accept the flimsiest hearsay as hard evidence. Innocent people are routinely executed. De Coster is of course describing an historical reality however bizarre it might appear to the young reader or anyone unfamiliar with the history of the era. “La légende et les aventures héroïques, joyeuses et glorieuses, D'Ulenspiegel et de Lamme Goedzak au pays de Flandres et ailleurs” is a nasty anti-Catholic novel similar in nature to other French novels of the era such as “The Hunchback of Notre-Dame” by Victor Hugo and the “Wandering Jew” by Eugene Sue. If you enjoyed either of these two odious works, you will likely enjoy “La légende … D'Ulenspiegel”. Tijl Uilenspiegel van Charles de Coster, gelezen in een editie van uitgeverij Voltaire uit 2007, met tekeningen van Peter van Hugten.Het eerste boek dat ik ooit kocht bij de boekhandel die ik ook nu nog frequenteer.Tijl, Tijl kennen we allemaal, Tijl is de olijke, daar kennen we eigenlijk slechts vrolijke verhalen van. Tijl en Lamme die de boel op stelten zetten.Dat is slechts één zijde van dit boek, het is namelijk ook een aanklacht en wellicht een niet geheel historisch correcte inkijk in het dagelijks leven van vlak voor en tijdens de 80-jarige oorlog.Een aanklacht tegen de adel, de adel die doodleuk meedeed met de lukrake beschuldiging en vervolging van de ketterij. Vervolging die hoogst lucratief was, daar de bezittingen van de ketter en vaak ook zijn familie, door kerk en adel rücksichtlos werden genaast.Driemaal raden wie daar ook met vlijt aan mee deed, althans volgens Tijl. Toch blijft ie niet rancuneus, want later in het boek gaat ie met Lamme meevechten in het leger van de prins.Ook de vrouwen worden in dit boek niet overgeslagen, hoewel Tijl niet echt honkvast genoemd mag worden, altijd weer keert hij terug naar z'n ware lief Nele, over wie hij in het verhaal slechts met het hoogste respect spreekt. Dit in tegenstelling tot de verhalen over de overige vrouwen die in het boek voorkomen, niet dat hij die niet zou respecteren overigens, maar het meeste respect gaat het gehele boek door naar z'n ware. Mooi is dat, zouden we nu misschien zeggen, wellicht is het eerder de juiste vertolking van hoe de menselijke aard in elkaar steekt. Tijl Uilenspiegel is een mooi boek, mooi uitgegeven en een plezier om te lezen. Gelezen in de Nederlandse vertaling van Chris van de Poel.Omvangrijke roman over de legendarische figuur Tijl Uilenspiegel, die De Coster ferm in De Nederlanden van de zestiende eeuw plaatst, en na enkele (semi)citaten van zijn legendarische potsen, opvoert als een geuzenstrijder in de Nederlandse opstand.Aldus komt Tijl vele historische personages tegen, zoals Alva, Willem van Oranje, Brederode en Admiraal Lumey. Maar het zijn Tijls naasten die het meeste indruk maken: de almaar etende Lamme Goedzak en de in-goede Nele.De oorlog wordt echter extreem zwart-wit voorgesteld (Filips II is een wreed monster die het onschuldige Vlaanderen onnodig teistert) en neigt naar complottheorieën (de beeldenstorm is in opdracht van de Spanjaarden zelf georganiseerd - jaja). Bovendien is de roman erg onsamenhangend, en slechts één geheel door de vele herhalingen ('de asse van Claes klopt op mijn borst'; 'doch hij lachte niet') en de soms erg poëtische quasi-archaïsche stijl.Mede door zijn enorme omvang (181 hoofdstukken in vijf boeken) hangt de roman daarom vaak als los zand aan elkaar en vereist die een behoorlijke voorkennis van de gebeurtenissen in het begin van de Tachtigjarige oorlog om de losse passages allemaal goed te kunnen volgen.Net als de opstand speelt de roman voor een groot deel in Nederland af, wat gek leest voor zo'n Belgisch-Nationalistisch boek. Maar aan het einde - wanneer de Spaanse Nederlanden verloren gaan - komt dit Belgisch Nationalisme groots om de hoek kijken, en zijn het ook de Walen en de Nederlanders die het arme Vlaanderen in de steek hebben gelaten. Niettemin een interessant werk met zeker schitterende momenten. One of the most favorite books of my childhood. I reread it and, surprisingly, found it as captivating as before. 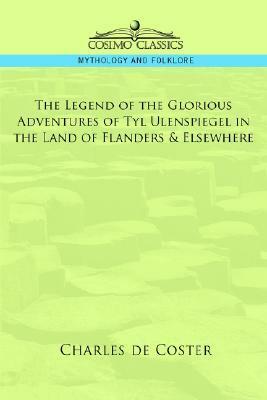 The book is a heroic fable of liberation of Flanders from the Spaniards hull of funny and scary adventures of brave and witty Tyl and fat and kind Lamme. The whole story is reeking of Rabelaisian humor and Flemish Sturm und Drang. Basically it is not even a novel, it is a poem with its own rhythm and various refrains. A good book to read as a young person, because it is full of heroism and good humor, and lacks and even ridicules any pragmatism. Hm. Wel leuk om eens een schelmenroman te lezen (en wellicht één van de beroemdste), maar het is niet echt mijn ding. De wel erg beeldend beschreven folteringen zijn niet bepaald geschikt voor tere zieltjes en het enorm bijdehante gedrag van Tijl Uilenspiegel wordt op den duur wat irritant en voorspelbaar. De hoofdstukken hebben onderling bovendien weinig samenhang, waardoor het af en toe meer op een reeks korte verhalen lijkt. Er zitten wel leuke gebeurtenissen tussen, vandaar toch nog twee sterren. I read this book in a teen age and I was very fond of it. It's like Don Qixote and Sancho Pansa - Flemish Edition, only Qixote is more pragmatic and Pansa is fatter )) One of the best books to get familiar with the history and culture of medieval Benelux countries. It's heroic, romantic, somewhat pagan, anti-war, anti-religious, anti-totalitarian, anti-brainwashing, in short, VERY HUMANISTIC! Tot mijn verbazing bleek dit feitlijk in het Frans geschreven te zijn. Toch staat het bij de Vlamingen hoog aangeschreven. Typisch, zou ik zeggen...Het verhaal is bekend, maar gaat niet over de grappen van Uilenspiegel, maar eerder over het droeve wel en wee van de bevolking in de roerige tijden van de Opstand der Nederlanden. Het werk zelf kon mij maar matig boeien. read a cheap edition during the busdrives to and fro to work at that time. in the midst of happy noisy schoolkids. trains stocked with silent and devoted people heading for office is not the right place to read these stories. Long ago I read the Flemish version, which I can't find here on Goodreads. The one I read is out of print anyway.I read it when I was about 16, and I'm pretty sure I'll enjoy reading it again, now at 59. One of the best gifts ever. Thank you, Dad! Perhaps the best book about food ever. Otra de mis viejas glorias, no sé cómo aguantaría el paso del tiempo, la verdad, pero me voló la cabeza en su día. Charles de Coster - Charles-Théodore-Henri de Coster was a Belgian author; though the son of a Flemish father and Walloon mother, he wrote in French.